Papua, Indonesia’s easternmost province, is known for its lush rainforests and diverse wildlife including the famed birds of paradise. Like most biodiversity-rich places, however, the area is threatened by illegal hunting and illegal logging. 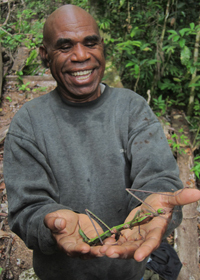 One man working to protect his home and its rich biological resources is Alex Waisimon, a community leader and conservation worker from Jayapura, the provincial capital of Papua. Following his work at Red Cross Asia Pacific and the International Labor Organization, his stint as a chef in an Italian Restaurant in Hamburg, and his experience as a tour guide in Bali, Mr. Waisimon decided to return to Papua in 2014 to pursue his dream of providing a source of livelihood for his community. He lives in the Rhepang Muaif area, which has a forest that is home to 84 species of birds from 31 families. It is categorized as an Important Bird Area because it provides refuge to five endangered species including the Casuarius unappendiculatus, Harpyopsis novaeguineae, Goura Victoria, Psittaculirostris salvadorii, and Epimachus bruijnii. It is also popular as the home of the birds of paradise (Cenderawasih). Six species of birds of paradise from the Paradisaeidae family can be found in Rhepang Muaif. Unfortunately, these birds are hunted because of their beauty and cultural value. Believing that he can protect the forest while providing economic benefits to his community, he developed a sustainable ecotourism program in Kampung Rhepang Muaif Unurum in the Jayapura Regency that features the Cenderwasih birds of paradise. For him, the key is reaping benefits from the forest without destroying it and ensuring that future generations will still enjoy the opportunity to see the forest and the biodiversity that it harbors. Despite the initial refusal that he met from villagers, Mr. Waisimon pursued his sustainable ecotourism program. He invited local and foreign tourists to guided trips of his community and the surrounding forests. During tours, he shares not only the astonishing sights of birds of paradise and other wildlife, but also local wisdom that his community treasures as keepers of the forests. He also talks to visitors about the importance of biodiversity and the role that people play in conserving the web of life. In August 2016, Mr. Waisimon received support from 10 heads of tribes to manage a 19,000-hectare forest as a sustainable ecotourism site. The heads of tribes also handed over 98,000 hectares of forest to the government to be managed as a national park. Mr. Waisimon is also actively fighting against illegal logging by conducting routine patrol and implementing awareness raising activities among tourists and locals. He formed a monitoring group that assigned people to monitor the activities inside the forest and capture all those who violate rules on the use of the forest. He also formed an economic creative group that produces Noken, woven bag made from wood fiber. WWF regards Mr. Waisimon as a supporter of community-based forest management, which is focused on giving community members like him the legal authority to take the lead in managing land they rely on to survive, as well as making decisions on how that land is used. He and other leaders in Papua learned about this approach in 2015. They have committed to using the community-based forest management approach to manage the land responsibly. He also built the School of Nature to promote the urgent need to protect forests to ensure the survival of the community and the birds that inhabit trees. Young people are happy to listen to his stories about the trees, forests, and wildlife. Wanting to share his community’s story, he spoke at international events such as Marrakech Climate Change Conference 2016, the International Conference on Biodiversity, Ecotourism, and Creative Economy 2016, as well as WWF’s events. His message: The trees in the forests store carbon dioxide and other forms of carbon and, by doing so, help mitigate climate change. The forests are ideal habitat for birds and hundreds of other species found nowhere else on Earth. The forests help purify the water hundreds of tribes in Papua rely on to survive. And so much more. As a community leader and conservation worker, he provided a means of livelihood through the bird watching ecotourism program, while inspiring tourists and local communities to cultivate a love for nature and respect for forests. His ultimate goal is to protect forests for future generations. “Indonesia’s rich biodiverse nature is our gold and it’s up to us to protect and keep our nature shining for generations to come,” Mr. Waisimon said.